Which is worse, turning into a monster in a state of anger or being separated with the love of your life? When it comes to the Superheroes of the Marvel world, there really isn’t a choice. In the case of The Incredible Hulk, his nightmare doesn’t stop with an altered physique or a broken heart, and it doesn’t end with finding that ideal pair of pants either. Edward Norton plays Bruce Banner, a doctor working with the U.S Army researching gamma technology when things went terribly wrong in an experiment performed on himself. After an over-exposure to the gamma rays, he turns into a destructive green monster with superhuman strength. Destroying everything in an uncontrollable rage, he left his girlfriend Betty Ross (Liv Tyler) injured and fled to Brazil. Now a fugitive, Banner is escaping the capture from General Ross (William Hurt) who wants him back under the pretence to avenge his daughter. What the General really wants is to manifest Banner’s newfound powers into creating the ultimate weapon, the Super Soldier. Following the hugely successful Iron Man played by the charismatic Robert Downey Jr, and the flop of Ang Lee’s 2003 version of Hulk, all eyes are on this film to revive the franchise. Was it credible? This is The Incredible Hulk and it is indeed incredible. It is two hours of continuous intense story telling right from the opening credits, which is well done with a sequence of flashbacks that leads us straight into the story. I used the word “intense” because unlike the witty and humorous Iron Man, this is a film dealing with emotions of anger, despair and violence, hence the PG-13 (MPAA) rating. It is a darker story compared to Iron Man or Spiderman, which feature a lot more light-hearted humour and fun. If you’re familiar to the Batman franchise or the more recent Batman Begins (2005) and the up-coming July release of The Dark Knight (2008) then you will know what to expect. The Incredible Hulk is brilliant in four parts with all of them distributed nicely in every quarter of total screen time. In the first part we are re-introduced to Dr. Banner and the Hulk, and we see him seeking refuge in Brazil practicing meditative breathing to control his emotions that causes the undesirable monstrous transformation. To keep alive, he works at a drink bottling plant doing the odd jobs while at the same time trying to find a cure to his gamma poisoned fate. He was doing so with some help from a mysterious online friend. To stay anonymous they use the names Mr Green and Mr Blue (guess who is which). For a good period of about 6 months he had kept to his routine until he accidentally cut his fingers when fixing a switch at the bottling plant. Unknowing to him, his blood dripped into one of the bottles that were later shipped into the United States. That was how General Ross got the clue to his whereabouts and all hell breaks lose once again. The next three parts will see Banner back in the states continuing his search for a cure, his encounters with his love and his enemies, and of course the finale battle with another equally strong but uglier monster known as The Abomination. Hulk’s nemesis in this film is Emil Blonsky (Tim Roth), a veteran soldier with an unquenchable thirst for a good fight. Like an arcade fighting game, Hulk will pitch himself against Blonsky in three rounds with the latter getting angrier and stronger with each fight. What captivates in The Incredible Hulk is the way it is filmed. Director Louis Leterrier from The Transporter (2002 & 2005) franchise and Unleashed (2005) did a fantastic job with the pacing of the film. He kept the intensity of the film in check with emotional and fast paced action sequences that are certain to raise your heart rate and give you an adrenaline rush. Luckily none of us are gamma poisoned. The exchanges between Banner and Betty Ross are also equally heart felt. The film also depicted the bad personalities of society. General Ross is a classic example of those who make bad judgments and decisions in life one after the other and in the process hurting the one he loves the most. Emil Blonsky is another who is just spoiling for a good fight for no good reason at all. On a last note, the good thing is our green hero is someone who understands the fact that we cannot get rid of our temper by losing it. That is my kind of hero, someone guided by conscience and good moral. Maybe that is destiny for Dr. 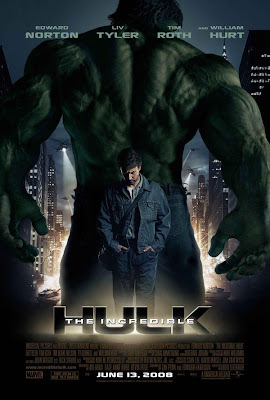 Banner who is given the power to turn into the Incredible Hulk who is described by the Dr. Stern (Tim Blake Nelson) in the film as perfect and god-like. “Maybe you can control it,” says Betty Ross. “But I don’t want to control it. I want to get rid of it,” says Banner. But he cannot get rid of it and there can be no running from destiny. A part of me says there is a Hulk in each of us.